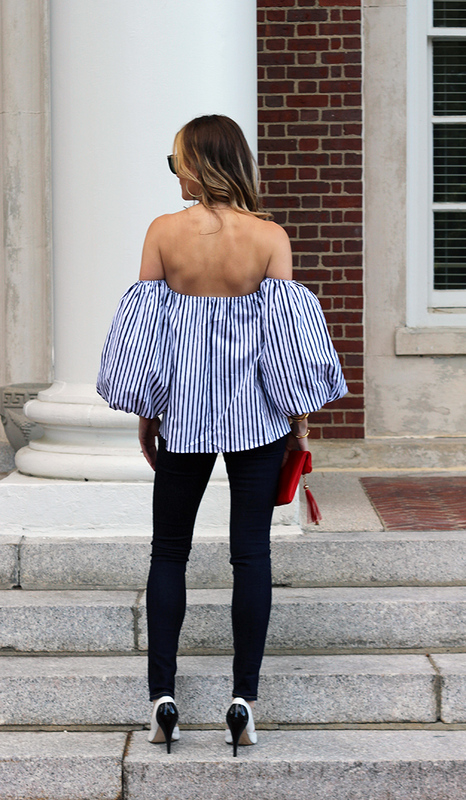 Off-the-shoulder, stripes, and big billowing sleeves? Yes, yes, and yes! 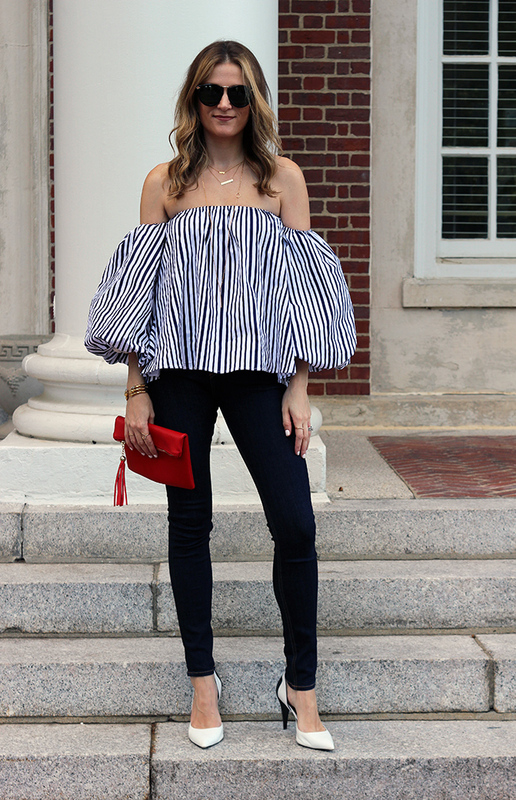 This Chicwish stripe blouse is pretty much my dream come true. 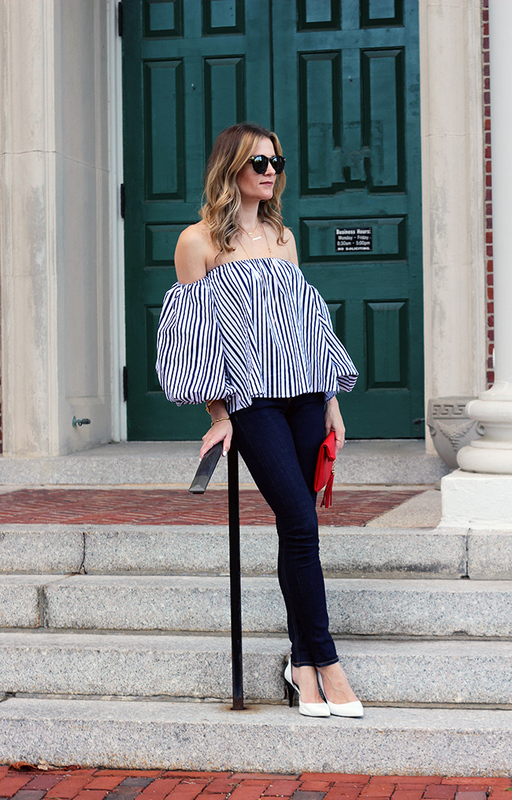 I initially wanted to pair this top with my flare jeans, which you may have seen on my Snapchat (Rach480), but because I couldn't decide the perfect shoe to complete the look, I went with my usual skinnies. These Rag & Bone jeans are actually a dark blue, but have to admit that they look almost black in these photos. I loved how the blue and white stripes looked against the dark denim, and I finished my look with white pumps, and a red clutch for a pop of color. Although this top would look amazing with a pair of white shorts to complete the summer, I love it paired with the dark denim (flare or skinny) for look that will take me straight through the fall. I'm still obsessing over these Karen Walker sunnies from Ditto, but I can't wait for my new designer pair to come, and to show you what I picked out! Ditto offers a subscription service where you can borrow designer sunglasses, and swap them out for new pairs as often as you would like. In case you missed why I'm loving Ditto's Endless Eye Wear Program, you can read about it here. If you want to try this awesome service, you can get your first month free by using the code THREADSFORTHOMAS at checkout. 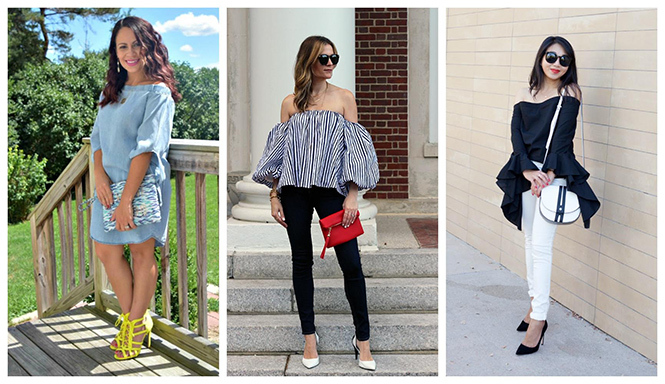 The feature blogger is Meagan from Meagan's Moda. I love how she makes a cozy cardigan look so chic, and how beautiful is her watch? Make sure to visit her blog and say hello. ooo you look fabulous! That red purse is the perfect pop of colour with this outfit. Wow, Rachael! I love the drama you have created with this entire look! 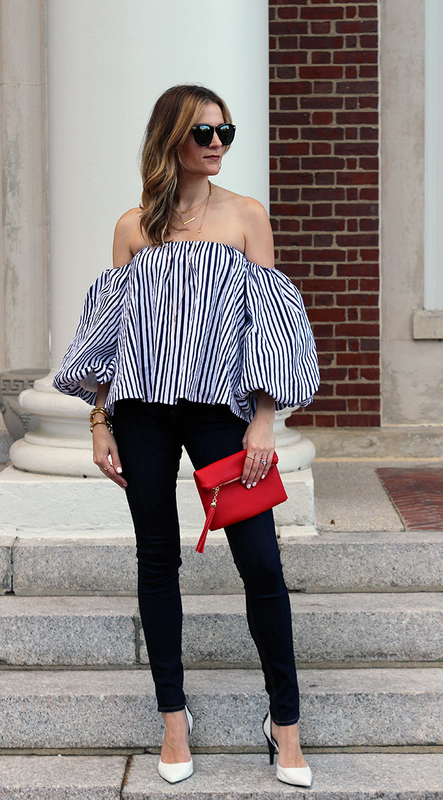 The stripes, the off the shoulder, the billowy sleeves, the skinny jeans, the sky high white heels, the adorable red bag! Absolute perfection! You look amazing in this top!! What a fun top! 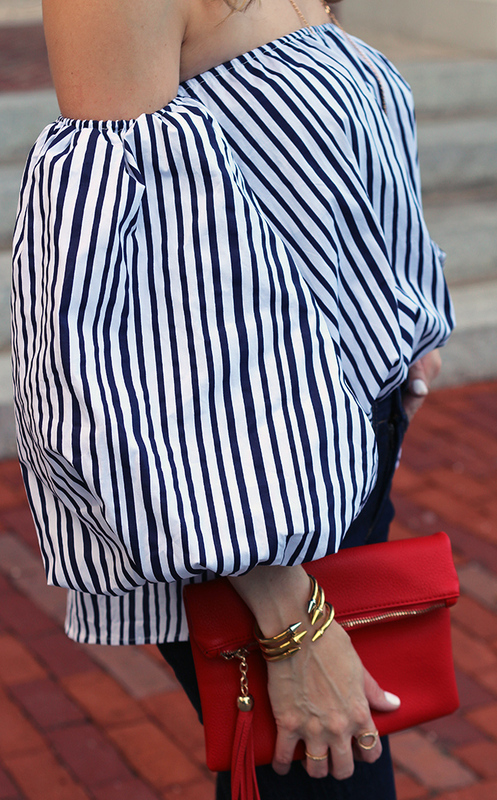 Love the stripes and the sleeves! You look amazing! Rocking this sleeve trend!! Loving how you kept it black and white and paired the volume with skinnies. You know how much I love this top!! Perfect pairing with those fun heels, and of course - I LOVE the pop of red! I just LOVE this top- so romantic but still had some edge. You look amazing! Love your jeans and heels! LOVE!! You look amazing! 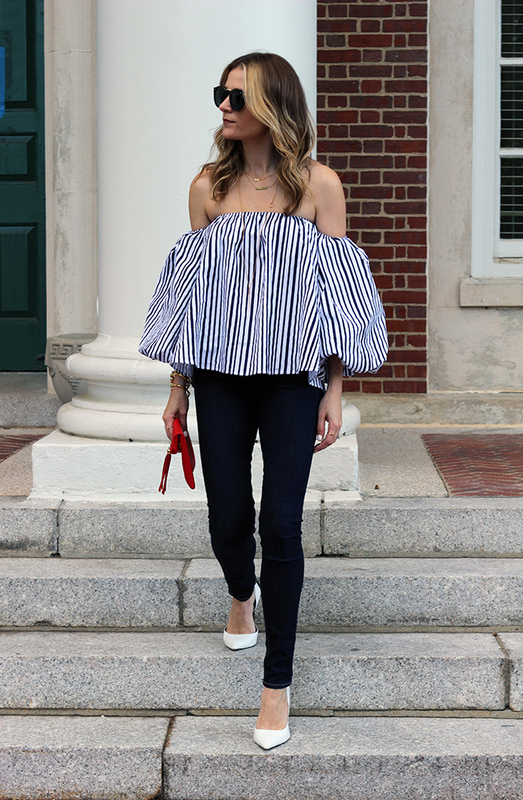 This top is so beautiful, and you styled it perfectly! Such a great look! 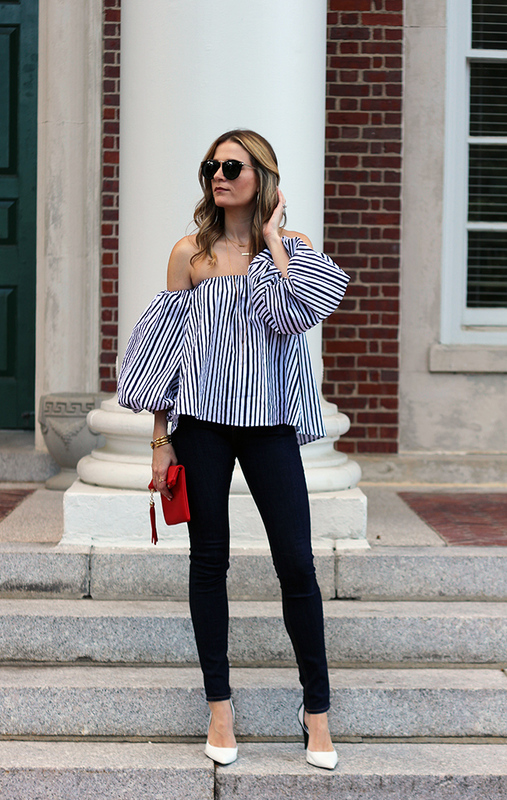 The striped top is a dream! You look fabulous in the jeans and gorgeous heels! Thanks for the linkup & have a fabulous weekend! What a statement those sleeves make! I love your bright pop of red with your purse! This top is so fab! I love the stripes and big sleeves! Such a classy look! I love your top and how you atyled it! Such a beautiful look. I love this trend so much! You are rocking this look! I love the statement top and how you accessorized it! This top is everrrything! You look great! That's one of my favorite tops! Love how you styled it! Such a stunning look! I love that top!